FTC Disclosure: I borrowed this from my school library and the library got it as a gift from Edi at Crazy Quilts! Summary (from the back of the book): Jasbir, aka Jazz, has always been a stellar student and an obedient, albeit wise-cracking, daughter. Everything has gone along just fine--she has good friends in the "genius" program she's been in since kindergarten, her teachers and principal adore her, and her parents dote on her. But now, in her junior year of high school, her mother hears that Jazz was seen hugging a boy on the street, and goes ballistic. Mom immediately implements the Guided Dating Plan, which includes setting up blind dates with "suitable", pre-screened Indian candidates. The boy her mother sets her up with, however, is not at all what anyone expects; and the new boy at school, the very UNsuitable hottie, is the one who gets Jazz's blood boiling. When Jazz makes a few out-of-the-ordinary decisions, everything explodes, and she realizes she'll need a lot more than her genius education to get out of the huge mess she's in. 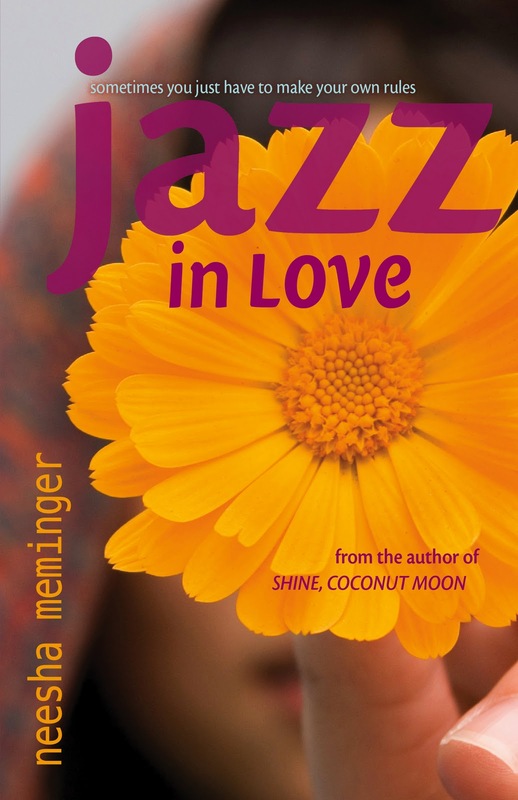 Can Jazz find a way to follow her own heart, and still stay in the good graces of her parents? 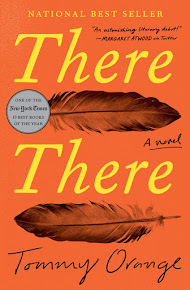 Review: What a fun novel, I can't wait for students to read it this coming school year. Yes, it's a common story: girl meets boy, dates the wrong one, etc, but I love the "stuff" that makes this book more than just a romance or the traditional teen angst book! And I'll confess that I thought I saw the ending coming a long way off and I was wrong... I love that! Jazz is a great character, she is smart, interesting, has a good family and great friends. However, her parents are very protective and strict when it comes to Jazz's dating and personal life. Their religion, Sikhism, plays an important role in her daily life (not cutting her hair, not dating, etc) and that is an interesting aspect to this book. I really liked that I learned about another culture while reading a fun novel. Like most teens, Jazz is trying to figure out how much she can get away with while still staying on mostly-good terms with her parents. Of course, she oversteps the bounds a few times and her parents are furious, but I like that all parties are reasonable about what's going on, they are all trying to figure out how to make it work. The secondary characters are also fun and are a great mix of people. Her best friend Cindy is the friend we should all have: totally supportive; tells you when you're being a jerk (but likes you anyway); and goes along with crazy schemes. The boy that Jazz' parents choose for her life partner (and they are only 17 years old!) adds a wonderful twist to the story. I can't say anything more about that since it would ruin the book for you. And the Dr. Babaloo and Auntie Kinder story is a nice parallel to Jazz's. Their story enables the reader to learn more about Indian families meeting up with the modern world and shows how extended family is so important in Indian culture. If you want a fun, lovely read, then this is a definite must. Click to see my updated Google Map. 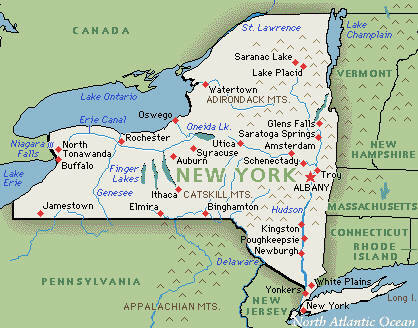 This book isn't really specific about where it takes place, but I am pretty sure it's New York state. 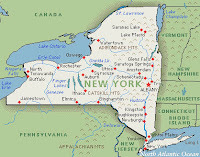 The characters are a five hour drive away from New York City and it doesn't seem unreasonable to them to meet someone who lives in Canada. 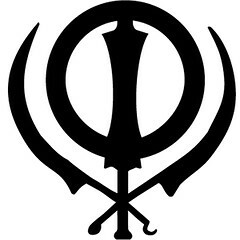 However, the dominant culture represented in Asian Indian and Jazz' religion is Sikhism (hence the above symbol).